The one design Class returned to our shores in November bringing to Malta some spectacular sailing as well as the opportunity for local sailors to work with some of the world’s renowned Race Officials. Organised by Yachting Events, the RC44 Valletta Cup saw ten, one class design boats, arriving in Malta earlier on in November to be ready for the final race of the RC44 Championship Class Tour. Nine boats who had taken part in 2015 returned to Malta whilst French team Aleph made its first appearance in the Valletta Cup. First on the schedule was Match Racing in the Grand Harbour, which incidentally was closed for the larger part of the day to ensure a safe haven for the boats. In its tensest conclusion ever, the RC44 Match Racing Championship came down to the very last race of the very last flight, victory ultimately falling the way of Torbjörn Törnqvist’s Artemis Racing. Fleet Racing took place under challenging conditions throughout the four day period, though perhaps most disappointing was the last day when the wind never filled in enough to allow the final races to be sailed. The final event of the year concluded with very close results – Chris Bake’s Team Aqua s won the RC44 Valletta Cup by a point from Igor Lah’s Team CEEREF. 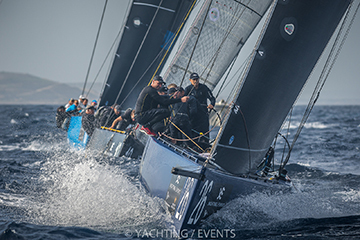 But with a two point advantage going into this final event, Team CEEREF claimed the overall RC44 Fleet Racing Championship title for 2016 by a point from Team Aqua.